Use Holbein Acrylic Modeling Pastes to build up richly textured surface forms on canvas, board, or other painting substrates. They come in a number of specialized formulas. Like all Holbein art materials, these pastes are formulated to meet some of the most stringent quality standards in the industry. They are packaged in unique, freestanding poly bags — tough, durable, and better for the environment than standard rigid plastic containers. Light Modeling Paste — his modeling paste is lighter in weight, fluffier in texture, and more flexible than Holbein's other modeling pastes. This allows you to build up more voluminous shapes with less weight. 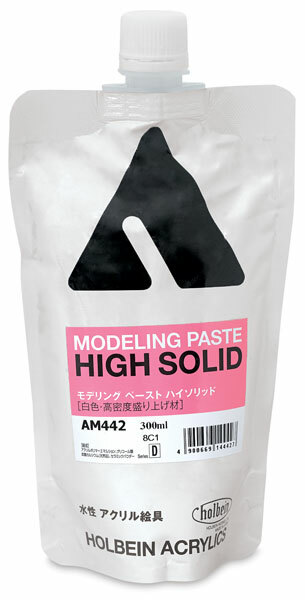 High Solid Modeling Paste — Ideal for layering, this paste allows for the creation of extra-thick forms on your painting surface. Pumice Modeling Pastes — Offered in standard, coarse, or extra coarse, these pastes make especially good grounds for pastel. The addition of pumice granules lend a grainy texture to built-up forms, and results in a tooth similar to sandpaper. Standard Modeling Paste — This all-purpose paste can be mixed with acrylic colors or overpainted. Once dry, it can be carved.